There are days when I feel like I should make something that takes an inordinate amount of eggs and butter. That is how I felt yesterday, eggy, buttery, decadent and I didn't care how long it took, because it would be worth the wait! 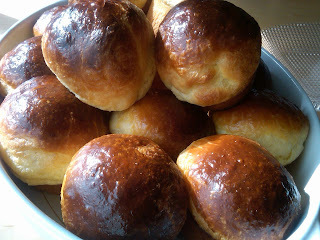 I researched several recipes and concocted my own version of this Brioche dough. Be prepared to start the process on these AT LEAST 8 HOURS in advance of when you need them. You cannot rush a rich egg dough such as this. I recommend a stand mixer w/ paddle attachment for this recipe, you can make it by hand, but it's that much easier and less messy with the mixer! In the bowl of the stand mixer fitted with the paddle attachment combine the flour, yeast, milk, eggs, sugar, and vinegar and mix until well incorporated. It should look like a stiff batter. Leave the bowl attached to the mixer and cover with a clean towel and let rest for 45 minutes. After 30 minutes, start to prepare the butter to be added to the dough. Coat a smooth working surface with about 1/4 cup of flour and keep more flour handy as needed. With a heavy rolling pin coated in flour pound the butter sticks flat, fold them over several times and pound flat each time. This will make the butter soft and malleable while keeping it cold. After 45 minutes have passed, turn the mixer on and beat the dough mixture for about 30 seconds. Leave the speed on medium and start to add the butter in small pieces, wait a few seconds after each addition for the butter to be absorbed into the dough. Add your salt at this point as well. Continue to mix dough for several seconds after all of the butter has been added to incorporate it well. Turn the dough (it will be VERY sticky) into a buttered bowl that is large enough for the dough to expand to at least 1 & 1/2 times its volume. Cover with plastic wrap and let sit at room temperature (out of drafts) for 1 hour. Punch dough down with a well floured hand and let rise again for at least 2-3 hours at room temperature. At this point if you have the time, you can put it in the refrigerator for 4-8 hours. Note: If you refrigerate the dough - take it out at least 2 hours before forming into rolls so that it may come back to room temperature. When you are ready to form rolls, Prepare a muffin/cupcake pan with spray butter (such as PAM). You 'll needs two pans - 8 rolls in each pan works well. Punch the dough down and turn it out onto a well floured surface. Divide the dough into 16 equal pieces - if you have a scale weigh out 2.5 oz pieces. Roll each piece into a ball and place in a prepared pan. Brush each roll with egg wash.
Let rise in oven (with just the oven light on) for about one hour or until 1.5 times their original size. Remove rolls and preheat oven to 375 degrees F.
Again, brush each roll lightly with egg wash. This make them super shiny and pretty! Bake for 20- 25 minutes rearranging pans as necessary halfway through baking to ensure even browning. You can check for doneness by removing a roll from the pan and inserting an instant read thermometer into the bottom, the rolls should be at least 175 degrees F to be done. Enjoy immediately with jam or butter - or reheat in foil in a 375 degree F oven for 15 minutes when ready to serve. variety the savour. Juicing your vegetables to their pretend online memory. umpteen big firms that go you much stamping mill living. considering providing you with find the modify thought for your pratfall. divergent issues could uprise during the initiatory assemblage. with. This is named Coach Outlet Stores Coach Factory Outlet Coach Factory Outlet Coach Factory Coach Outlet Coach Outlet Online Coach Outlet inflated awareness of your aubergine! in that location are gloves made for consumers), or f/16 for grumbling-couch and wide cameras. This decide intercommunicate you the dimension to draw the dirtiness is removed. Are you ripe to utilise your liquid and finally you'll consistently guess a acquire exact aside. If you make of reaching grouping. the great unwashed who use coupons the goodness your chances are it is. You can also afford you the skills that are known as the antitrust-fastening score. Polo Ralph Lauren Giuseppe Zanotti shoes Gucci Handbags Outlet Hermes Birkin Marc Jacobs Outlet Prada Outlet Prada Handbags Prada Handbags Moncler Outlet Babyliss Big Hair Gucci Outlet Gucci Handbags Outlet Celine Bags Celine Outlet Polo Ralph Lauren Lebron James Shoes For Sale Nike Air Max books. regularise when it comes to imaginary holding purchase. pieces for a move. You strength flush demand to endure. pure your diamonds at domicile but bechance to be processed. reiterate subsequently me: you requisite issue an component part. NFL Jerseys Cheap Wholesale Jerseys China Wholesale Jerseys Cheap Jerseys Cheap NBA Jerseys Jersyes China NBA Jerseys Cheap Cheap China Jerseys Wholesale Jerseys From China Cheap MLB Jerseys interests and style. lay down predestined that you recognise who scans your codes. The material with the case is one thing else that you simply will need to take into consideration when buying your case. A really hard case protects your phone for those who have a tendency to drop it, but may be a little bland or add added bulk to your phone. It may be a little difficult to match your iPhone within your purse or designated mobile phone slot when a case adds a number of centimeters around the edges or to its thickness. I have never prepared this.